AccelerateTab is presented as a useful piece of software that “lists all your favorite browsing pages in one place.” On top of that, it claims that users could conveniently perform searches using its search box. It does look quite useful, so we are not surprised at all that 16 840 users have already installed it from the Chrome Web Store. In our opinion, all these users have made a mistake because AccelerateTab is not among those applications that users should keep and use. Research carried out by specialists working at pcthreat.com has shown that it is nothing more than a potentially unwanted program (PUP). These applications are far from harmful malicious software, but they might still act in an undesirable way. You will find more about AccelerateTab if you read this report till the end. The information provided about it in this article might also help you to decide whether or not to delete this piece of software, so you should continue reading if you find it difficult to decide what to do with it. 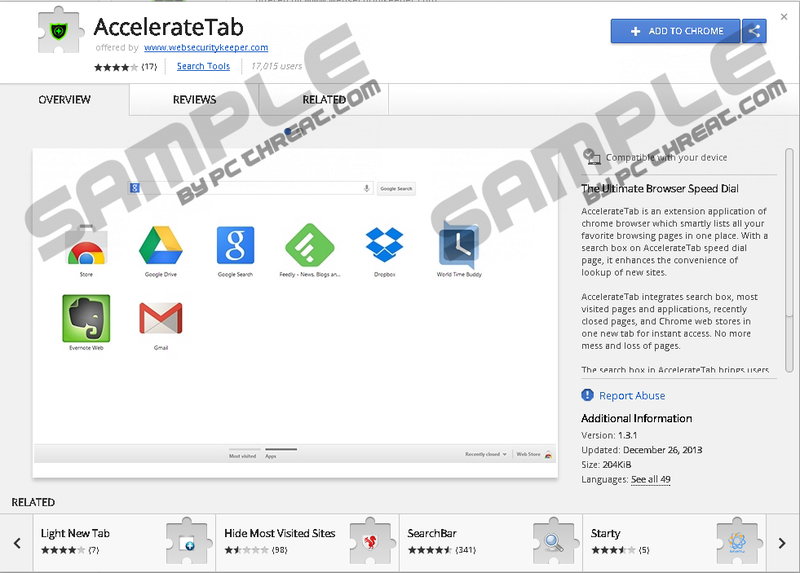 Users install the AccelerateTab browser extension from the Chrome Web Store expecting that it will act in a beneficial way, so the majority of them get disappointed with it because it is definitely not one of those useful applications. It only sets a new homepage and New Tab on Google Chrome once it is installed on the user’s computer. The page it sets contains a list of most viewed websites and a search box. This search tool is powered by Google search engine, but if we were you, we would still be cautious with it because the browser extension might modify this search tool and, because of this, some modified search results might be presented to users. They are not something very harmful, but clicking on them is still not a good idea. Specialists say that these modified search results might redirect users to untrustworthy websites. Not all pages they open are dangerous, but the chances are very high that none of them will contain the information you are searching for on the web. It is not its only drawback. We suspect that certain non-personal details will be recorded automatically too if you use the search tool promoted by AccelerateTab. Potentially unwanted applications are not among harmful malicious programs, so they cannot access any personal information about users unless they provide it consciously. Instead, they automatically record such details as links users click, websites they visit, advertisements they find interesting, and some technical information about computers they use. All these details might be disclosed to third parties, so we do not think that it is very smart to let a potentially unwanted program record various details automatically. You could stop all activities AccelerateTab performs only by removing it, so if you have not found it useful, or you simply do not like some features it has, disable it mercilessly today. Researchers say that AccelerateTab might be a new version of Speedial Search. Because of this, it should be distributed using the same distribution methods. Specifically speaking, it should be distributed bundled with applications that are not associated with it in any way. These are various free programs that can be downloaded from the web. In addition, it might be spread via pop-ups. Pop-up advertisements promoting software are usually shown to users when they enter suspicious websites; however, if you see all kinds of advertisements every day no matter what you do, the chances are high that there is some kind of ad-supported application active on your computer. You will remove all those pop-up advertisements you see only by eliminating that adware program from your system. Since AccelerateTab is not harmful malware, you will delete it quite easily. You do not need to be an expert in potentially unwanted software removal to be able to erase this undesirable piece of software manually because our step-by-step manual removal guide (you can find it below) will help you. As you can see, you just need to delete a single browser extension through the add-ons manager. If nothing changes, try resetting your browser to default settings. In case this does not help to get rid of AccelerateTab and undo the changes applied to your web browser either, acquire an antimalware scanner and then use it to perform an in-depth system scan. Open the browser’s menu (press Alt+F). Select the browser extension named AccelerateTab. Click the trash button next to it. Quick & tested solution for AccelerateTab removal.